These are a meal in themselves. They are quick to make and easy to assemble. They’re really self serve and definitely encourage fun conversation at the dinner table. I love the addition of quinoa; making it a well-rounded meal and the quinoa keeps you full longer. About the sauce: we've tested other recipes for peanut dipping sauce and nothing compares to this one. This sauce is BOSS. It's creamy, easy, and has just two ingredients. It definitely induces serious cravings! P.S. the kiddos love these best with ranch. Place chicken breast in a medium bowl, add marinade and stir to coat the chicken evenly. Refrigerate for 20 minutes (prep your veggies in the mean time). Once chicken is marinated, heat a large skillet over medium heat, add the chicken along with some of the oil in the marinade and sauté until caramelized and browned on both sides and fully cooked. If chicken breasts are very large, you might cover with the lid when sautéing the second side for the chicken to cook through. Rinse quinoa in a fine colander until water runs clear to get rid of any natural bitterness. Quinoa is cooked similar to rice. The ratio is 3/4 cup dry quinoa to 1 1/2 cups filtered water. I cooked mine in the rice maker on the white rice setting without adding any salt or butter and it was done after about 20 minutes. Transfer quinoa to a bowl to cool. 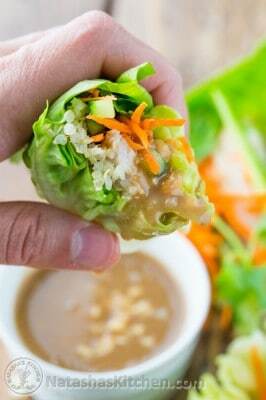 You want it to be room temp or cooler before using in lettuce wraps. Combine 3/4 cup sesame ginger dressing with 2 Tbsp creamy peanut butter and whisk together or shake together in a tupperware with a tight fitting lid. Transfer to a small bowl and top with chopped peanuts if using. Place all prepared vegetables on a platter: lettuce, sliced cucumbers, sliced carrots and sprigs of cilantro. Add your bowls of chicken, quinoa, and peanut sauce to the serving platter. You can either pre-assemble the lettuce wraps or let your hungry folks assemble their own (my favorite method!). Start with the lettuce leaf, add a heaping Tbsp of cooked quinoa, a strip or two of chicken breast, sliced cucumber and carrots along with a couple sprigs of cilantro. Drizzle with prepared creamy peanut sauce and be prepared to love this.